Little Man is different. Oh so very different. (not short-bus different, don't get me wrong) He needs his Mama to comfort and soothe him through all of life's many challenges. (like strangers aggressively cooing at you) Sometimes he makes me feel so special, like nobody else in the world will do. Only I can make everything seem alright again. Every morning when I pluck him out of his crib, he gives me a big hug. 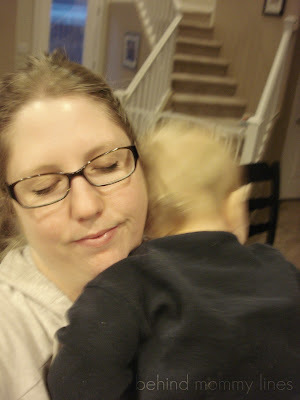 When he's tired and cranky, he makes a face, lets out a grunty sigh, and then plops his head on my shoulder. His little head lingers there and we have a little "moment." I just know he's saying "Oh, Mommy. Life is just so hard sometimes, but at least I have you." For me, time falls to the wayside and I can just feel all the love radiating from my heart to his. That's what I look like during the ultra crabby hours before the kid's bedtime. It's about survival- not looking pretty. All hail the pony tail. Man, I love this little guy like crazy. I can already tell we're going to have quite a special bond. I totally agree with the difference of boys needing their mommy's more. I love it! It's a good different!